The top ten percent of earners in the United States took home more than 50 percent of all income in 2012, the highest amount ever recorded since data was first collected in 1917, according to an updated report from economists Emmanuel Saez and Thomas Piketty. This follows a trend since the recovery officially began. 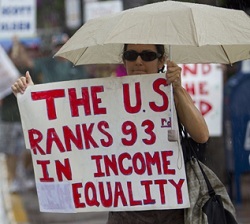 From 2009 to 2012, income for the 1 percent grew by 31.4 percent, while everyone else only saw it grow by 0.4 percent. That means the 1 percent “captured 95% of the income gains in the first three years of the recovery,” they write. The authors point out that rather than the Great Recession helping to mitigate income inequality, which has skyrocketed since the 1970s, it only temporarily disrupted a trend that is now continuing. And policy isn’t helping. Given that recessions only have a temporary impact on top earners “unless drastic regulation and tax policy changes are implemented and prevent income concentration from bouncing back,” the United States would have to aggressively implement changes that could reverse the trend. That’s what happened after the Great Depression, when the New Deal was enacted. But the response to the Great Recession, which mostly amounted to the Dodd-Frank financial reform bill and an increase in the top tax rate, “are modest relative to the policy changes that took place coming out of the Great Depression,” they write. It’s unlikely they will make any lasting change. Read More Wealthiest Americans Take Home Biggest Share Of Income Ever Recorded | ThinkProgress. This entry was posted in News from the Soul Brother and tagged Economic Inequality, Emmanuel Saez, Great Depression, Great Recession, New Deal, Percentage, Thomas Piketty, United States. Bookmark the permalink.